Smile and take a selfie for your chance to win a £20 Aylett’s gift voucher this Autumn Festival! Our Autumn Festival celebrates the start of a new season and the beautiful colours that it has to offer. Autumn is the best time to see our famous Dahlias in all their glory, our Dahlia marquee showcases hundreds of cut blooms of over 40 Dahlia varieties, complimented by autumnal foliage centred around the theme of the native butterfly – the displays are truly inspiring and a spectacle not to be missed. For a little light hearted fun and to celebrate the change in seasons, we have set up our very own Selfie Station just outside the marquee for the duration of the Festival. 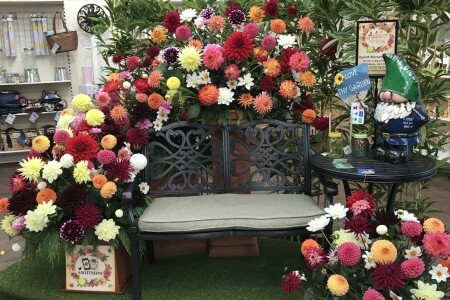 Pop along and take your selfie amongst the Dahlia’s, upload it to Twitter and Tweet, post on Facebook, or share the photograph on Instagram, with the hashtag #aylettselfie for your chance to win a £20 Aylett Gift Voucher! The best selfie as chosen by the management team will be selected on the 18th September and you will be notified by Direct message on your chosen social media channel ! Don’t forget to tag Aylett Nurseries too! – the more you post and share, the more likely we are to see yours! Next Post: LAST WEEKEND OF FESTIVAL FEVER – Don’t miss out!